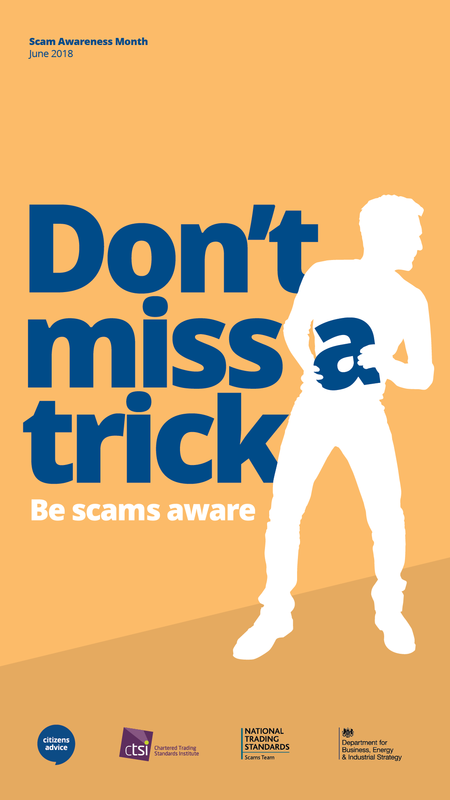 This month, Citizens Advice are raising awareness of common scams. Spam emails and texts, cold calls on the phone and “suspicious activity” alerts from your bank are unfortunately becoming part of modern life. Over the past 2 years near three quarters of people have been targeted by scammers. These fraudsters are becoming more sophisticated and persistent, so that more of us are falling victim. Often people don’t tell anyone that this has happened to them, because they feel shame or embarrassment – but this is what the scammers are hoping for! The less people know what they’re up to, the more they can get away with. Remember it’s not your fault – scams are a form of criminal activity. If you are victim of a scam it’s important to report it to Action Fraud on 0300 123 2040 or visit the Action Fraud website, and tell friends, neighbours and relatives about scams you become aware of. One of our clients was contacted out of the blue by BT, saying that there was a problem with her broadband and they needed to access her laptop. The client got her internet from BT so thought it might be genuine until they asked for her computer password in order to access her account. Fortunately she was aware that passwords are never requested by genuine organisations and so didn’t give the fraudsters access to all the private information on her computer. She reported it to BT as well as Action Fraud and is passing the message around to be aware.